★IMPORTANT! iEGrow New F17 keyboard case ONLY fit for 2017 New iPad(2017 released) and iPad Air(2013 released). ★Clip-and-go ultra slim 8mm and light weight Bluetooth keyboard for iPad 5th generation with 10M range for easily writing messages while on-the-go. ★Auto sleep/wake feature built into the durable smart cover for your iPad 5, triggered by opening/closing the lid. ★Keyboard for iPad 2017:Ultra slim design adds maximum protection with minimal bulk . Real hard laptop style keyboard with high end ABS material. A spring mechanism underneath each key ensures a tactile response with every stroke, helping you type faster and with less errors than on a touchscreen. ★Stand for iPad 2017: Multi Angle Design allows you to dock your tablet into comfortable typing position. 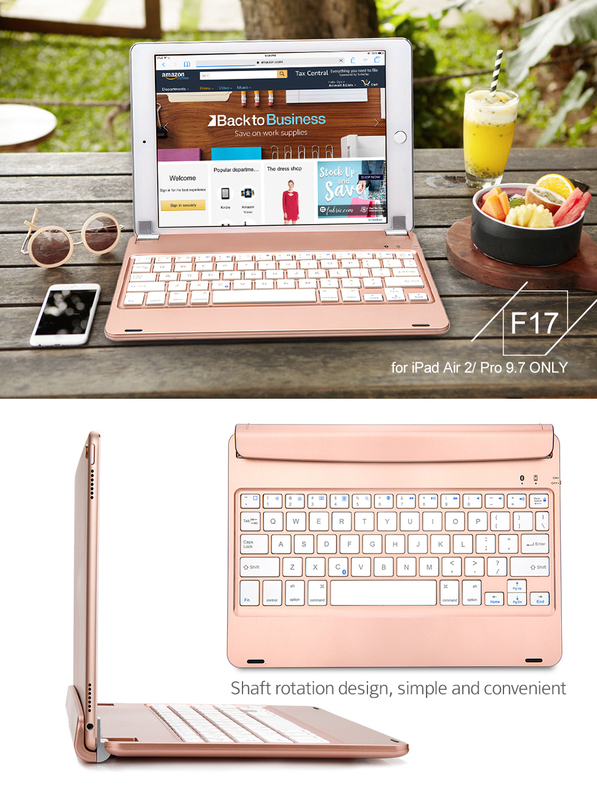 Sturdy swivel hinges let you open and close iPad Air again and again just like a notebook, Macbook, or laptop! The F17 new iPad 2017 keyboard with stand is the smartest addition for your iPad 5. An elegant case, the iPad adds protection, and functionality to your iPad. Comfortable, high quality and natural ABS keys provide a quick response and natural typing experience. Bluetooth keyboard can used with other Bluetooth-enabled devices. Turn your iPad into an ultra portable laptop.